" 2/3 of the Earth´s surface is covered by water and just one water drop contains all our knowledge. What we do not realize is that 1/3 of this water is already polluted. " 1 liter of drinking water cost only $ 0.02 per liter. This is including energy, amortization, maintenance and a laboratory test once a year to generate 720 liter purified drinking water per day. Systems with higher performance and systems for the desalination of seawater are also available. Compared with conventional systems, the Blue Building concept is more cost effective. The system does not use chemicals. 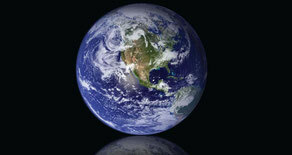 The population worldwide is growing, more pressure is put on water resources. 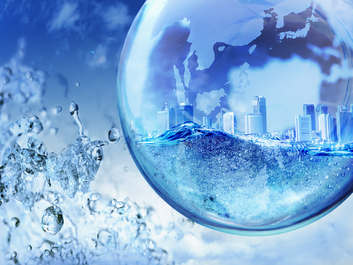 In the upcoming decade, what will be the most serious problem concerning water situation? Will it be water shortages, a breakdown in the infrastructure to obtain and supply water or is it water made undrinkable by pollution? How much money has already been spend and will be spend for solutions? We do have the key for this problem; without chemicals; with significantly high quality and lower than normal market conditions production costs; as much water as a country needs. Soft drinks, cola, tea, coffee, juices, alcoholic beverages and mineral water, so called saturated liquids, are burdening the human body enormously. Scientists claiming, for instance the famous hydrologist Prof. Claude Vincent (University of Paris) that water for example, acts as purifying and detoxifying to the body at a conductance of 129 microsiemens. His long-term studies clearly and unambiguously show that with rising ingredients (high conductivity) of drinking water, serious diseases are increasing considerably. Chlorinated drinking water is responsible for a significant increase of illness. It is not important what our drinking water contains, but if it detoxifies our body. Also known as HWT 90, Blue HWT Water treatment System is a new generation of water treatment plants designed for those parts of the world where the supply of clean drinking water is problematic. A compact water treatment system was developed, directly aiming at the final consumer. The plant can be adapted to various crude water qualities - from inferior tap water to seawater - due to its modular construction. The fully automatic system guarantees a user-friendly operation and a consistently high quality. In many regions of the world the quality of drinking water is quite insufficient. Analyses of that water often show high levels of dirt particles, salt and bacteria. Poor raw water quality, old pipe systems or high ambient temperatures are just a few reasons for that. The-Environmentalist has developed a compact purification and disinfection unit preferably to be used in kitchens or similar applications. The raw water is pumped through a pre-filter. Raw water can be drinking water of bad quality or water loaded with high levels of particles, salt and bacteria. The raw water is pumped through a pre-filter, after passing the pre-filter the water is treated by the first UV-light disinfection unit. The UV-radiation kills bacteria and germs, so that the water is almost free of biological contamination. The disinfected water is pumped by a high pressure pump through the cross flow filtration system. Cross flow filtration membranes with different pore size such as ultra-filtration and / or reverse osmosis are used depending on the raw water quality. The water flow is divided by the cross flow filter into two output flows: the purified permeate flow and the concentrate flow, containing salt and particles. Cross flow filtration produces a flow that is horizontal to the filtration direction. Small particles and molecules larger than the membrane pore size rating will be retained at the surface of the membrane, not in the polymer matrix consisting the micro porous membranes. The ultra-filtration works with a backwash system. The backwash system and the design of the filter modules and installations ensure a minimum consumption of backwash liquid. The flow is monitored on the filtrate side to eliminate the danger obtaining erroneous reading due to pollution. The pulsating backwash is triggered at a present low limit value of the filtrate flow and cleans the entire filtration area swiftly and economically. The reberse-osmosis filter works like the cross flow filtration. With the reverse-osmosis procedure semi permeable membranes are used. An ideal, semi permeable membrane keeps back salts of the raw water and only clean, salt-free water can pass. After purifying the water (permeate) is pumped by a circulating pump into the storage tank,where a second UV-light unit kills all bacteria and germs that might have survived treatment of the first disinfection unit and passed the membrane. Thus, the water in the storage thanks is supposed to be almost free of biological contamination. The storage tank is fitted out with a level switch, interrupting the purification unit when the storage tank has reached its upper level. If the fresh drinking water level has reached the lower level, the plant will start again automatically. Integrated warning and safety measures prevent the system from working at incorrect parameters by triggering a warning light or even by switching off the complete system. Data performance: approx. 10l/h volume of storage tank: 10 liters material: stainless steel 1.4571 nominal power consumption: AC 230V / 50Hz, max. 300W. The Antarctica lost more ice, than was added by annual precipitation. per second 6.215 tons, which is equal 155 trucks (40-tons) are melting. How do we deal with our water resourses?